I am shocked this did not inspire more bad puns during #aquamageddon, the Boston area’s dirty tap water fiasco, last week. Above, The Standells perform their first hit single, Love that Dirty Water (1966). The song, now a Red Sox anthem and the soundtrack to my adolescence, is full of the sixties, when the profile of the polluted Charles rose with the environmental movement. 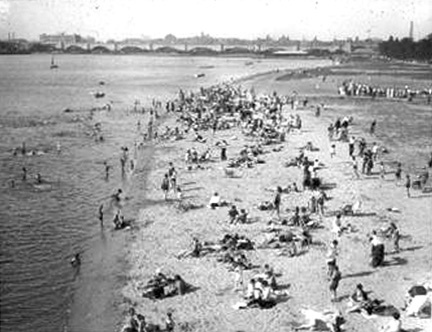 State park officials had shut down swimming in the Charles in the mid-50s, around then time when historian Bernard DeVoto described the Charles in Harpers Magazine as “foul and noisome, polluted by offal and industrious wastes, scummy with oil, unlikely to be mistaken for water”. Environmental agencies subsequently began testing the river, long a dumping ground, for contaminants, and the results were bad. In 1965, the year before the Standells’ hit took off on the Billboard charts, the Charles River Watershed Association (CRWA) formed to begin leading the cleanup of the Charles River and surrounding wetlands. Restoration took decades, an unsettlingly long time given the pictures of the oil slick approaching the gulf coast. The Charles River Conservancy finally jumped in the river to celebrate the milestone of swimable water in 2005. Bathers on the Esplanade in the early 1900s. Photo via the Charles River Conservancy. You can find more explanations here of city history in the lyrics on the Boston Strangler and BU women’s dorm curfews. This entry was posted in Boston, Music&Art, Old News and tagged 1966, aquamageddon, Bernard DeVoto, Charles River, Charles River Conservancy, Charles River Watershed Association, environment, Esplanade, Harpers, Love that Dirty Water, The Standells. Bookmark the permalink.